Eliot The gritty answer to Heatwave. Full of dirty, filthy, crunchy synth. Feels like interrogating criminal scum in an abandoned warehouse. Hefty bass and steady, deep beats flash their knives at you in an alleyway. Favorite track: Hardware. 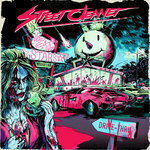 XARGON Street Cleaner has never messed around when it comes to synth, and Hardware is in my opinion one of his most dynamic and hard-hitting releases to date. Finishing up with Thug Feast was a great choice, I love albums that end on a brutal high note like that. Favorite track: Thug Feast. Fimbul Don't let the masked guy with the baseballbat near your hardware! It's false advertising! Favorite track: Never Pick Up Strangers (feat. Cogex). 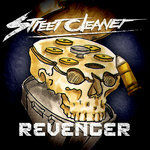 Get all 13 Street Cleaner releases available on Bandcamp and save 30%. Includes unlimited streaming via the free Bandcamp app, plus high-quality downloads of We Eat Like Stars, Heatwave, Hardware, Live, Revenger, Payback 2, Slade, Remixes and B-Sides Volume 1, and 5 more. , and , .